An eager and energetic group of UVM students from January’s ‘PSS 196 Community Gardening in the DR’ class rolled up their sleeves (and pantlegs due to rains) and pitched in as partners with ‘Seeds of Self Reliance’ and local community members to launch the new gardens at Batey Libertad. 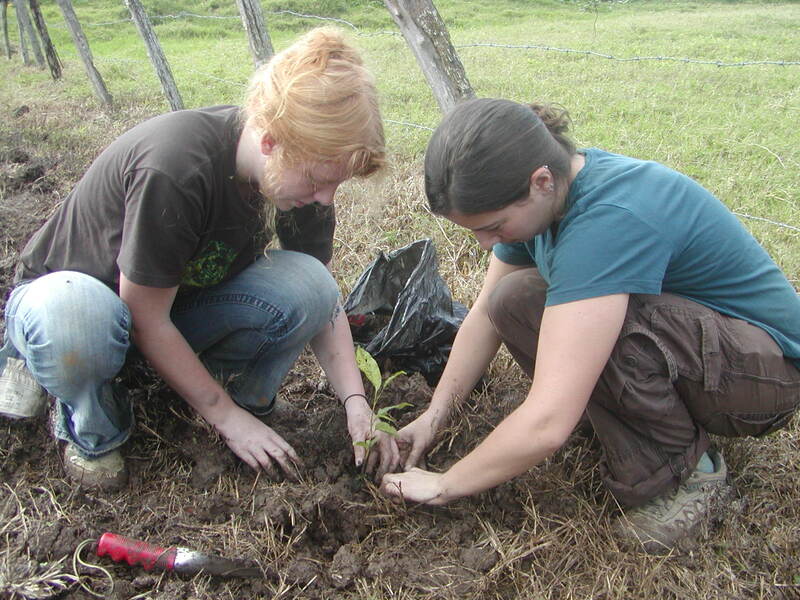 Undaunted by the rain and wet heavy clay soils, students spent 3 days and 3 nights learning about life in the Batey and helping to set up the gardens. In that short time, much was accomplished including, organizing a community meeting to exchange ideas on how the farm should be structured, removing and recycling debris from a burnt house, testing soils for pH and nutrients, fixing fence, picking up trash, collecting organic matter from the adjacent countryside to make a compost pile (wheel barrows of pig and cow manure, over 50 sacks of rice hulls, old banana stems, etc. ), building a compost and seedling shed, hand digging 200 feet of drainage ditch, creating a double dug vegetable bed, laying out an herb spiral and planting over 150 fruit, forage and hardwood trees. WOW! This amazing group of students also managed to expand their horizons, change their world views, make new friends, move two tons of children from place to place, and engage in cultural exchange through music, song and dance. I was thrilled and proud to be the class instructor, it was a fantastic experience for me also! Two of our students, David and Forest have volunteered to stay on in the community until mid March to keep the momentum going. They will be living right above the garden in the apartment attached to ‘the locale’.